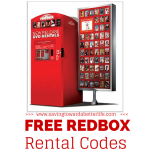 TWO FREE Redbox Game Rentals! 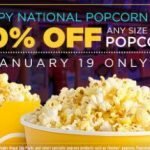 It’s National Popcorn Day and at Regal Cinemas you can save 50% of any size fresh popcorn! Valid January 19th only. Don’t feel like a theater movie today? Here are some other National Popcorn Day ideas! 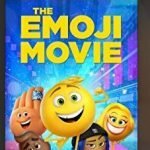 Grab a free movie night! Get a free Redbox DVD, Blu-ray or video game when you text VALPAK to 727272 You’ll receive a reply text with a code you can redeem for your free rental. Code expires 2/28/18. 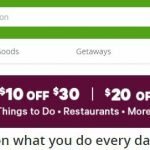 Groupon: Save $5, $10, $20 or $30 off deals | Score some GREAT Christmas Gifts! 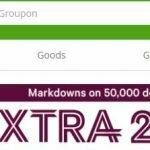 Groupon: Extra 20% off Deals | Score some GREAT Christmas Gifts! Join Redbox’s birthday bash! 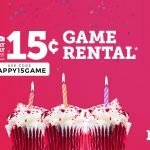 *EXTENDED FOR ONE MORE NIGHT* In celebration of its 15th birthday, Redbox is offering 15¢ Game rentals today (11/30) with the promo HAPPY15GAME. Join Redbox’s birthday bash! In celebration of its 15th birthday, Redbox is offering 15¢ Game rentals today (11/29) with the promo HAPPY15GAME. Join Redbox’s birthday bash! 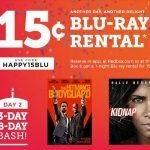 In celebration of its 15th birthday, Redbox is offering 15¢ Blu-ray rentals today with the promo HAPPY15BLU. 15 DVD Stocking Stuffers | 5 Titles under $5.00! 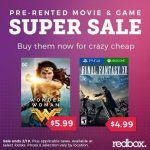 Through October 1st, Redbox.com is offering a FREE one night game rental when you reserve it online, no promo code required! Thanks A Frugal Chick!